We need to be a little careful with this chart, of course, since it is comparing stocks and flows. But what it shows is that a large uplift in loans in 2010-12 generated absolutely no additional net cash revenue - in fact cash revenue actually fell between 2009 and 2016. For a company whose entire business model relies on increasing net cash flow, this is disastrous. The distressed uptick in borrowing in 2016-17 is very evident, of course, but for me the real issue here is the steady excess of loans over cash revenue from 2013 onwards. The company was simply not generating enough money to reduce its indebtedness. So, high debt, poor revenue and zero productive investment. Now where have we seen a similar situation before? Ah yes. Greece. On a longer timeframe, of course - in Greece's case, the increase in indebtedness mainly occurred in the 1980s. But the pattern is the same. High indebtedness relative to revenue (GDP, in Greece's case) is fragile. All that is needed is a shock to income, and the debt becomes unsustainable. Deterioration in cash flows on a select number of construction contracts led the Board to undertake an enhanced review of all of the Group’s material contracts, with the support of KPMG and its contracts specialists, as part of the new Group Finance Director’s wider balance sheet review. This review has resulted in an expected contract provision of £845m at 30 June 2017, of which £375m relates to the UK (majority three PPP projects) and £470m to overseas markets, the majority of which relates to exiting markets in the Middle East and Canada. 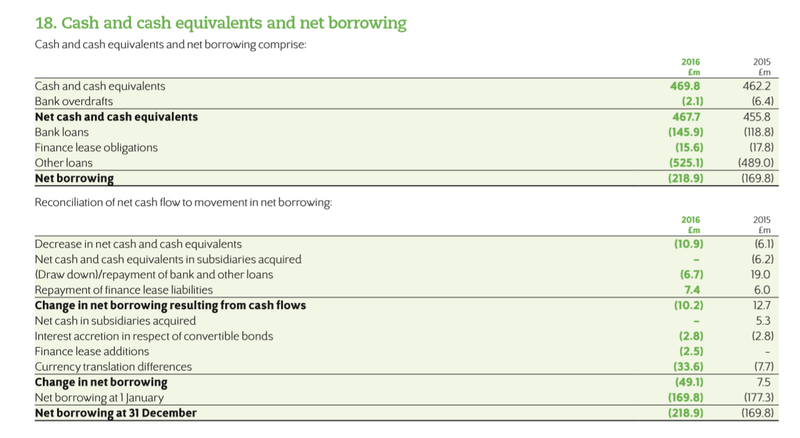 The associated future net cash outflows in respect of these contracts is £100m-£150m (primarily in 2017 and 2018). As a result of the enhanced contracts review and the strategic actions below, reflecting difficult markets and exits from certain territories, Carillion is issuing revised full-year guidance, with revenue now expected to be between £4.8bn and £5.0bn and overall performance expected to be below management's previous expectations. So although Carillion declared a profit in 2016, the cash flow deficiency was already painfully evident. The full-year accounts reveal a sharp rise in short-term borrowing from banks. I shall return to this shortly, since it calls into question the directors' decision to pay a dividend in 2016. Most of this borrowing was from banks, since repeated profit warnings make issuing commercial paper all but impossible. Banks will lend to distressed borrowers - at a price. 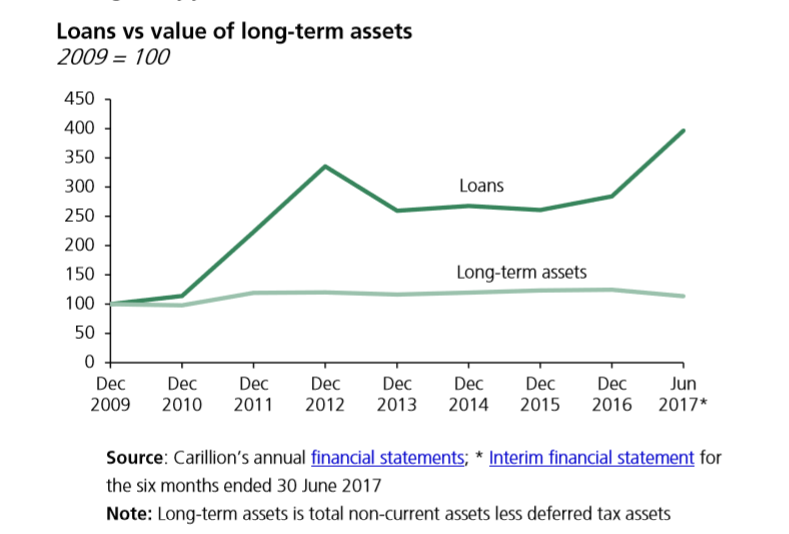 I hate to think what Carillion's short-term interest rates were by the end of 2017. 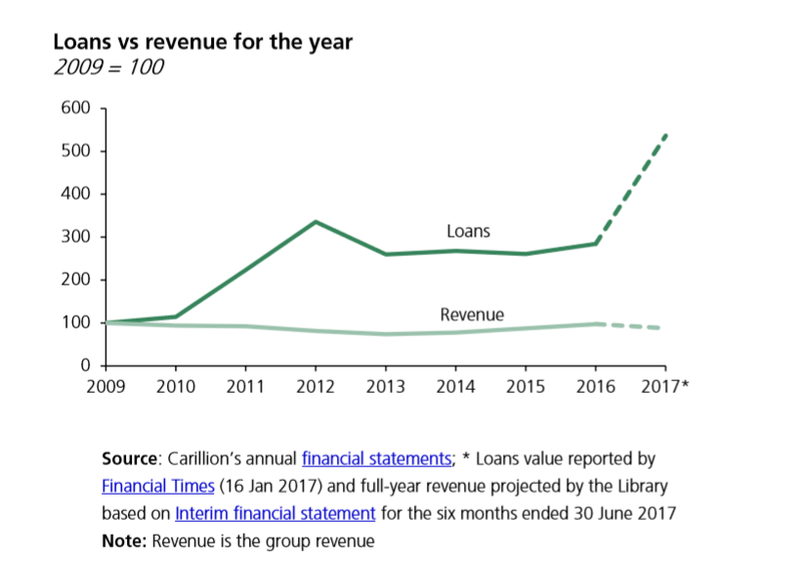 Even in 2016, Carillion's debt service cost it £30m. The cost for 2017 will be far higher. 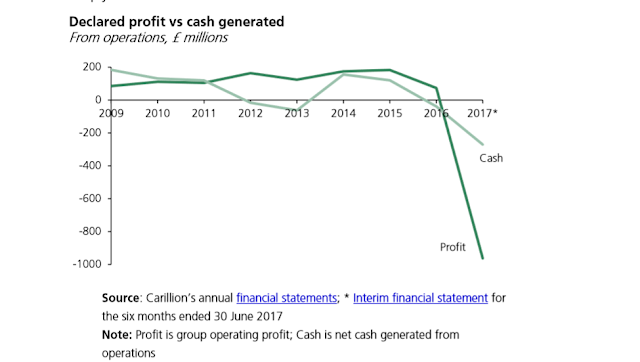 But how did Carillion's cash position deteriorate so much, so quickly? After all, the 2016 full-year accounts show cash of £469.8m, slightly better than the position at the end of 2015. A provision of £845m in mid-2017 shouldn't have caused the massive borrowing spike evident from the chart above. What was going on? If I borrow money from a bank, I have money in my bank account. It looks like "free cash", but it is actually encumbered by the bank's claim on my future cash flows. If I don't pay my suppliers for 4 months, I have money in my bank account. It looks like "free cash", but it is actually their money. This is why Carillion's cash position deteriorated so quickly. All of the cash on its balance sheet was already earmarked for other purposes. It could not absorb a cash flow shortfall of any size, let alone £100-150m in 2017 and 2018. But if Carillion's cash position was so dire at the end of 2016, how did it manage to declare profits and pay a dividend? ‘Aggressive accounting’ is the practice of declaring revenue and profits based on optimistic forecasts, before the money has actually been made. All is well if the forecasts are correct. But if costs rise and revenues fall (say, because of delays and defects), expected profits turn into actual losses. 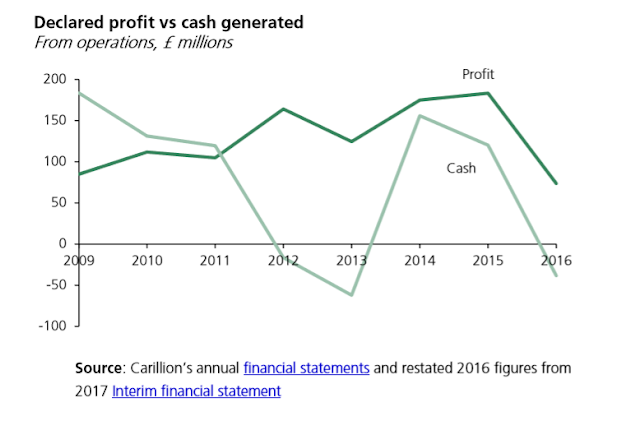 So, under the relevant accounting standard for a company like Carillion, declared profits depend entirely on management forecasts of future cash flows. "Aggressive accounting" would therefore involve taking an overly optimistic view of those cash flows. I am reminded of RBS's overly optimistic view of CDO valuations in 2008. That ended really well, didn't it? Admittedly, IAS 11 does advise that forecasts should be prudent. But the moral hazard for directors whose bonuses depend on strong profits is obvious. However, published accounts of public companies are independently audited. Surely the independent auditor would issue a warning if directors took too rosy a view of future cash flows? The Group recognises revenue based on the stage of completion of construction contracts by reference to the proportion of costs incurred to the balance sheet date compared with the estimated final costs of the contract at completion and therefore relies on estimates in relation to the final out-turn of costs on each contract. Changes to these estimates could give rise to material variances in the amount of revenue and margin recognised. Contingencies may also be included in these estimates of cost to take account of specific risks, or claims against the Group, arising within each contract. These contingencies are reviewed by the Group on a regular basis throughout the contract life and adjusted where appropriate. Finally, variations and claims are recognised on a contract-by-contract basis, both on service and construction contracts, where the Group believes the rights and obligations exist given the progress of negotiations. There is therefore a high degree of judgement in: assessing the level of the cost contingencies to recognise; appropriately recognising variations and claims; and estimating the revenue recognised by the Group based on the projected final out-turn on contracts. But there it ended. The rest of the commentary is all about justifying KPMG's decision to accept the directors' judgement. The company's financial position was clearly deteriorating; it had zero free cash and both its short-term borrowing and its trade receivables (customers who owed it money) were rising sharply. Yet KPMG saw no reason to warn shareholders about the possibility that deteriorating cash flows might cause serious difficulty for the company. I struggle to see how this is consistent with its role as "independent" auditor. But then I also struggle to see how Carillion's Audit Committee evaluating the independent auditor's "effectiveness", as it did in February 2017, is consistent with independence, either. Or the revelation, in the 2016 Audit Report, that KPMG was also doing non-audit work for Carillion. How can independence be assured if the auditor is working for the company it is auditing? ...management believes it is reasonably possible, on the basis of existing knowledge, that outcomes within the next financial year that are different from these assumptions could require a material adjustment. But they still went on to declare a dividend. 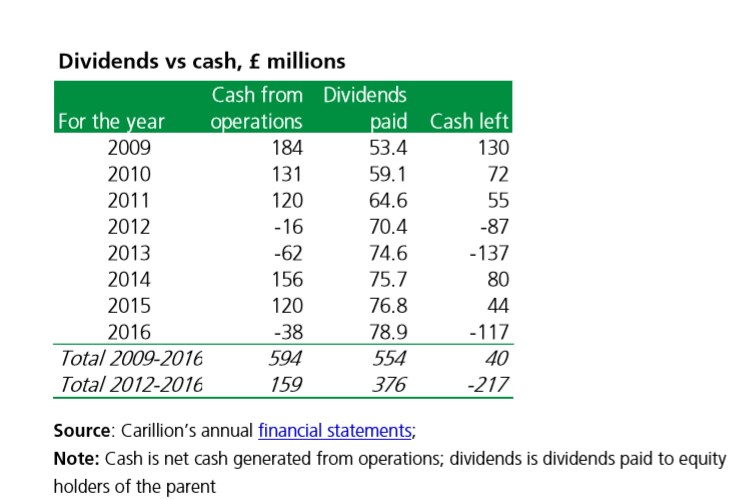 Carillion's accounting approach and dividend policy systematically worsened its cash position. Over-optimistic cash flow forecasts led to overstated profits, on which the company paid dividends that (with hindsight) are hard to justify. Dividends have to be paid in cash. If there wasn't enough cash from operations to pay the dividend, then the company was effectively borrowing to pay its shareholders. And it did so again in 2016. Declaring a dividend on a negative cash position when you haven't managed to make up the shortfall from the last time you did that is utterly foolhardy. To me, this smacks of a management that wasn't paying nearly enough attention to cash flow and its risks. The Commons researchers observe that the declared loss of £1.2bn in June 2017 wiped out all the declared profits from the previous eight years. But then those profits were never real anyway, were they? Taking an over-optimistic view of future cash flows didn't just overstate Carillion's profits and weaken its cash position. It also gave a false impression of the company's solvency. Had the cash flows been more realistically estimated, the goodwill asset that made up one third of the company's asset base would have been materially impaired in 2016 and possibly in previous years too. The risk – The Group’s balance sheet includes goodwill, principally arising from historical acquisitions in the UK. The risk is that the goodwill allocated to cash generating units (‘CGU’) is not recoverable and should be impaired. Due to the inherent uncertainty involved in forecasting and discounting future cash flows, which are the basis of the assessment of recoverability, this is one of the key judgemental areas for our audit. The Group annually carries out an impairment assessment of goodwill using a value-in-use model which is based on the net present value of the forecast earnings of the cash-generating unit (‘value-in-use’). This is calculated using certain assumptions around discount rates, growth rates and cash flow forecasts. Given the relative size of the goodwill in the Group balance sheet, particularly in the UK Services CGU, relatively small changes in these assumptions could give rise to material changes in the assessment of the carrying value of goodwill. But it nevertheless accepted the directors' view of cash flows. As a result, KPMG did not query the "going concern" basis on which the accounts were prepared. Rather than qualifying the accounts, it kept quiet and prayed for something to turn up. We could call this the Micawber school of auditing. The truth is that Carillion was living on borrowed time from about 2011 onwards. It survived as long as it did because accounting standards enabled it to disguise its true financial position, and auditors turned a blind eye. Had the accounting been done on a more prudential basis, it might have been obvious much sooner that Carillion had no cash, no profits, no assets, and no future. Carillion reports & accounts 2009-2016. All charts and tables are from the Commons briefing paper cited in the text, except for the Note 18 table from Carillion's 2016 report & accounts. Will KPMG face any consequences? Can they? What mechanisms exist to impose such? When a construction company is in trouble anyone new on any of its jobs will want to be paid upfront. This then forces the company to rely on existing appointed contractors. These contractors can then increase their rates knowing the main company has very limited options. There is pressure to get the job done on time else it's LADs payments. The liquidity and cost problems can spiral very rapidly. In the middle east doing a job and getting paid for it can be only vaguely related. Stepping back a bit. The UK construction industry has been operating a long way below capacity for a long time. This forces companies to bid silly prices for jobs. I suspect no one will suggest a steady and prolonged increase in infrastructure spending as a lesson from the Carillion collapse. No doubt management and some professionals have been useless or much worse. What about all the ongoing profits from the PPP projects? The PPP project companies still exist. They are owned by investment companies. Probably these PPP investments will be profitable for a long time, it will be very difficult for any government to get out of them. In a low growth world there is a shortage of profitable investments hence PPPs are a boon to the investment industry. If we were operating in a higher gowth environment there would be a greater choice of profitable investments and less need for PPPs. You can't defend PPPs but you can try to understand the forces that brought them into existence. The PPP/PFI story was motivated principally by putting large chunks of government borrowing off the Public Sector Borrowing Requirement, therefore keeping interest rates low, therefore pushing property prices up. The PPP/PFI companies were largely speculators (not building companies) who knew very well their role was to create convenient nominee wrappers for government debt, and priced their services accordingly and fabulously, using various agreed ruses to cream a large cut of the operation. You have talked a lot elsewhere about payments under the Supply Chain Finance Scheme becoming obligations of suppliers in the event of non-payment (to the banks) by Carillion (e.g. https://www.forbes.com/sites/francescoppola/2018/01/30/how-carillion-used-a-u-k-government-scheme-to-rip-off-its-suppliers/amp/). Are you sure that this is the case? Others seem to be of the opinion that these are obligations of Carillion, not the suppliers (see e.g. 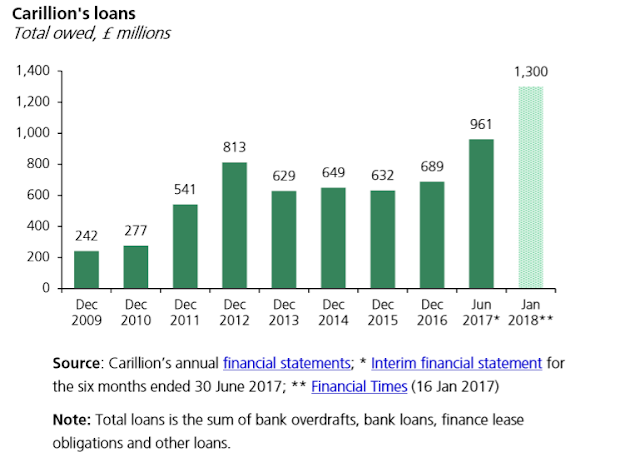 https://www.verdict.co.uk/leasing-life/news/company-news/carillion-500m-reverse-factoring-debt/). I had a long chat with a number of knowledgeable people about this. They concurred that the obligation rests with the suppliers, not Carillion. However, since then, others have disputed this. At least one bank did reduce its EPF facility before Carillion collapsed (Santander, which tried to close it completely in December but compromised on a limit reduction). This does suggest that it was Carillion's credit facility. However, Santander's decision might simply reflect the difficulty that the bank would be likely to have recovering losses from suppliers in the event of Carillion defaulting. I am trying to find the legal documentation for the UK government scheme. I am unconvinced by bald assertions that banks cannot seek recourse from suppliers. In guaranteed lending, when a guarantor fails, ordinarily the recourse is to the entity guaranteed, not the guarantor. I need to see conclusive evidence that this is not the case in this scheme. "Additionally, the EPF agreement would break down should either party – Carillion or a supplier – become insolvent." The EPF agreement has therefore broken down. The underlying position is that Carillion has not paid the suppliers their invoices, and those suppliers have borrowed from banks. The banks will seek recompense from the suppliers, and the suppliers must seek recompense from Carillion's receivers. As far as I can see, in the absence of anything to indicate otherwise, this is the legal position. I have not seen the documentation either, but the breakdown of the agreement in the event of the insolvency of a supplier would not, in of itself, confirm that the supplier was a borrower under the agreement. Similarly, not having seen the documentation, I am in no position to confirm or otherwise that Carillion was acting in the capacity of a guarantor as opposed to a borrower. Unless and until the documentation is secured and reviewed, bald assertions that banks cannot seek recovery from lenders are no different to bald assertions that they can. If the EPF agreement broke down due to insolvency of either party, the underlying contractual agreement between Carillion and its supplier would still apply. So, let's look at the underlying contractual agreement. 1. Supplier insolvency: if the supplier had outstanding invoices to Carillion against which it had borrowed from the EPF, Carillion would still have to pay those invoices. The supplier's administrator or receiver would record Carillion's expected invoice payments as an encumbered asset (ie not available to settle other creditor claims) which would fully discharge the supplier's loan obligations to the bank in respect of advances made under the EPF. 2. Carillion's insolvency: supplier has outstanding invoices to Carillion, against which the supplier has borrowed under the EPF. That borrowing would have been discharged when Carillion paid the invoices in accordance with its contractual agreement with the supplier. Carillion is now in default on its contractual obligation TO ITS SUPPLIER (not to the bank), so the borrowing will not now be discharged unless the supplier pays the bank from other resources. I hope this is clear. 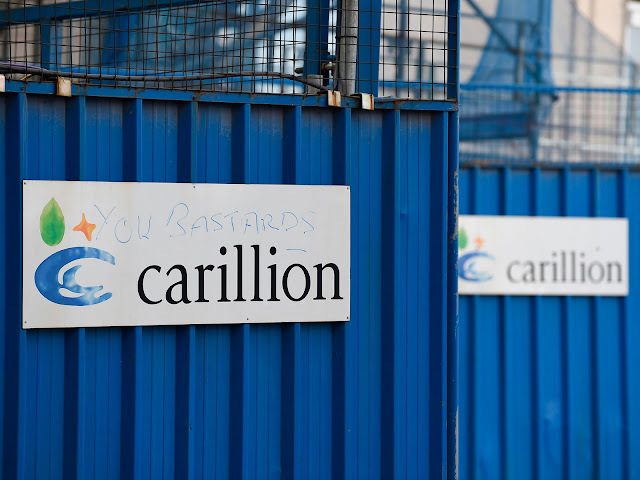 Carillion is in default on its contractual terms with suppliers, not banks. Suppliers will have to repay the banks and then try to recover the money from Carillion's receivers. Good luck with that. No it's not clear. It's your interpretation, without seeing any of the documents. It may be right but it has just as much chance of being wrong. If it turns out that it's a reverse factoring structure , then it's highly likely you are wrong. And, just to confirm, under such a structure (which would typically be non-recourse to the supplier given the nature of the relationships), suppliers have sold their invoices to the bank in question for due consideration, not 'borrowed' from it. But as I have said before, I have not read seen the documents so would not presume to make a definitive statement as to the position either way. "In 2012, Carillion announced that, henceforth, it was not going to pay its suppliers for 120 days. At first glance, that would be crippling from many suppliers. But not to worry, because if suppliers wanted the cash earlier, say after 45 days, Carillion had arranged with a bank to pay them earlier. There would be a small bank charge for this, but Carillion would cover the fee. So why did Carillion enter into this somewhat Byzantine arrangement? I believe part of the answer may lie in how it was able to treat it for accounting purposes. Essentially, Carillion was borrowing from the bank to bridge the gap in paying creditors. 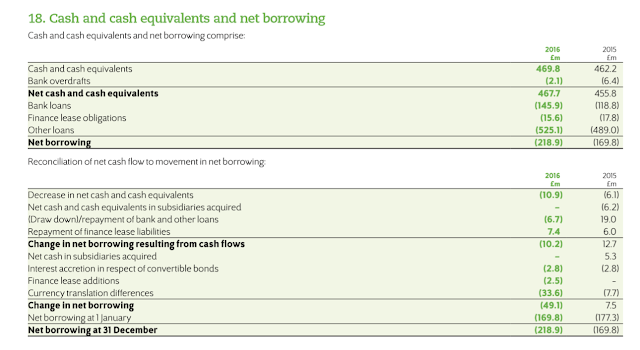 But this bank financing was recorded in Carillion’s balance sheet within ‘other creditors’ of £760.5 million, on p118 of the 2016 financial statement (this is apparently the case - there is no disclosure at all on this in the financial statements)".